As a tech blogger, I was invited to attend the IBM Developer Day 2019 held on 14th March at Taj Yeshwanthpur, Bengaluru. The above-embedded 1.5m highlights video made by me will give you a glimpse into the activities of the day. The highlight of the event was the keynote address by Ginni Rometty, Chairman, President & CEO of IBM. She emphasized the commitment to open-source technologies by IBM, especially on the wake of its recent Red Hat acquisition. But we ought to remember that IBM already had decades of expertise and commitment to open source technologies. One thing that Ginni Rometty was emphasizing on the stage was that, developers ought to also contribute to the open source technologies, as much as they take from it. For developers, this would be an excellent opportunity to learn as they would be exposed to a higher level of work environment that their companies may not offer. There was a panel discussion where the participants mentioned that the biggest myths about open source software were – Free of Cost, Full of Bugs, No Support, Contributors are mostly from US. They reiterated that none of the above was based on facts. They also mentioned that the role of the developer has evolved to think in terms of solving business problems, and not just coding. Shraddha Sharma, the CEO of YourStory mentioned the importance of telling more stories of coders, developers, engineers – creators and their creations, and how these have positively impacted the society, instead of making people look at pointless PPTs. Bob Lord mentioned that thousands of open-source code patterns were available online which developers can deploy today to solve specific business problems in their cloud, hybrid cloud, on-premises, offline, or edge computing systems. He urged developers to contribute back, as well. A couple of Interns from IBM demonstrated how one such code pattern could be applied to solve a real-world problem. They used a particular code pattern to scan the recent facebook photos shared by a user to determine the next tourist destination he/she is most likely to enjoy. Imagine how useful such personalisation would be to tour operators, for example. CallForCode.org is another exciting opportunity for developers to showcase their coding and problem-solving skills by developing an application to reduce the impact of natural disasters. 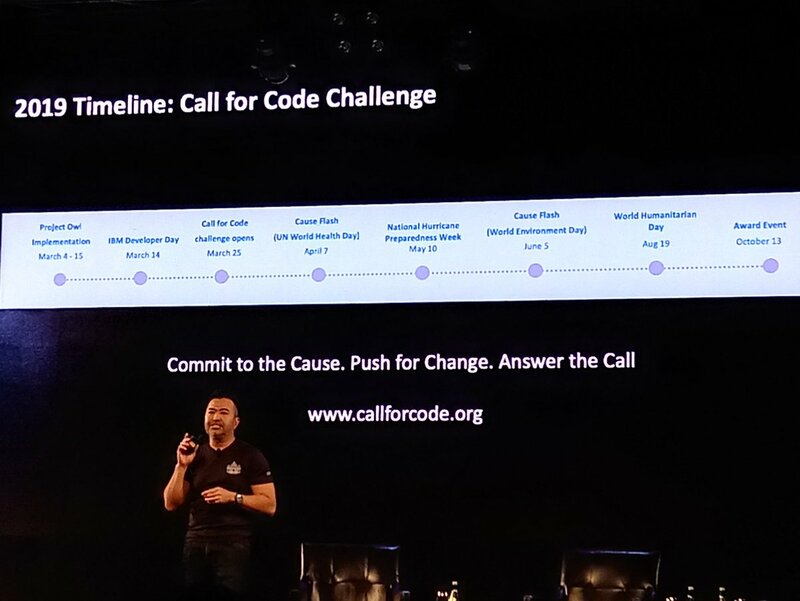 2019 is the second edition of Callforcode challenge and there are prizes worth up to $200,000 USD to be won. If you are a developer brimming with ideas, you’ll want to check it out. IBM also launched the India Developer Champions, a multi-year program that recognizes Indian developer contributions to the open source community. They also launched the Girls of Code program where each year 2,00,000 girls would be mentored to participate in the call for code and code response programs, while simultaneously readying them for new collar jobs. More details on these initiatives can be found here. If you are a developer, I am sure you agree that exploring these interesting opportunities provided by IBM would not only enhance your skills, but would also bring you handsome rewards. Go ahead, sign up to become an IBM Coder from here. You can learn from the community, complete the gamified tasks aka challenges – earning points while learning, and get to know the latest and hottest in tech.